According to legend and history, King Xerxes I of Persia at the Battle of Thermopylae in 480 BC demanded that the Greek Army lay down their weapons and surrender in the face of the overwhelming power of the Persian Army. Outnumbered by about 20 to 1, the Greeks might have been forgiven for complying with the demand. Certain death awaited the motley collection of 7000 Greeks, Thespians, Thebans, and a few others, and their deaths might have faded unnoticed into history if it had not been for King Leonidas of Sparta and The Three Hundred. Leonidas, The Three Hundred, and most of the assembled Greeks at The Hot Gates were slaughtered by the Persians, but The Three Hundred inflicted heavy losses on the Persians and significantly delayed their progress toward Athens. Leonidas’ defiance was a rallying cry to the Greek Army, and in subsequent land and sea battles the Greeks halted the Persian invasion, and Xerxes lost most of his 150,000 troops. My brother Ken and I are not Spartans and we didn’t succumb to hordes of Persians in a valiant but doomed last stand at Thermopylae. 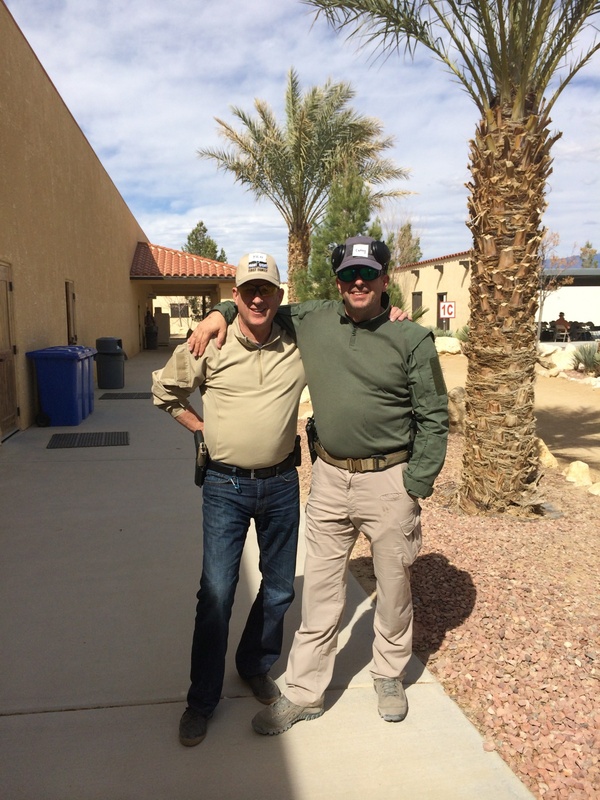 We did complete our four-day class in defensive handgun techniques at Front Sight Firearms Institute in Nevada this week, though, and we took our rightful place in history. I won’t belabor the details of the class – if you want a blow-by-blow of the process, you can visit the Front Sight website or read this blog post on The Crooked Path. There are three levels of achievement for the class: Distinguished Graduate, Graduate, and Living And Breathing Participant Who Didn’t Shoot Anyone, Didn’t Get Shot By Anyone, And Wasn’t So Obnoxious That He/She Was Introduced By The Rest Of The Class To The Pretty Blue Water In The PortaPotty. Ken and I were not Distinguished Graduates, nor were we LABPWDSADGSBAAWSOTHSWIBTROTCTTPBWITPPs. We were Graduates, which required that we score between 90% and 71% on the final skills test. Ken beat me on the skills test by a significant margin. We both limped and shambled during the class; he’s broken from the knees down, and I’m broken from the chin up, so there was no advantage either way. In true Spartan fashion, he merely took the opportunity presented to him. He’s never let me win at anything, and if I do happen beat him, I know it’s real. Did I mention that we’re competitive? My main physical problem was bradykinesia (slow movement – one of the many joys of Parkinson’s), which is usually not beneficial in a gunfight. However, there’s an old saying that you can’t miss fast enough to win, so speed isn’t always an advantage. They also say that “slow is smooth and smooth is fast,” so it stands to reason that I should have been the fastest shooter in the class. Not hardly, although I may eventually get an award for being the shooter with the best dance rhythm. As it always does, Parkinson’s intruded randomly on the fun. On the last day as we were preparing for the final test, I began to sway to the music, and not only did my accuracy and speed diminish, but my balance, coordination, and safety suffered. As the episode of dyskinesia worsened, I decided it was time to stop, and I dropped back to the shaded area at the rear of the range to rest and recuperate. I had a weapon in my arsenal that I wasn’t carrying on my last trip to Front Sight; I gave myself a shot of Apokyn, a rescue drug for the major movement-related symptoms of PD. That shot was the riskiest thing I did during the entire trip; I was much more apprehensive about safely hitting my stomach from six inches with a tiny needle than hitting a paper target at 15 yards with my 1911. The Apokyn worked its magic, and I was ready to get back into action just in time for the test and the man-to-man shooting challenge. The man-to-man challenge is a single elimination head-to-head competition to shoot 3 targets before your competitor does, and to avoid shooting penalty targets. The first finisher in each pair proceeds to the next round of competition; hitting a penalty target is cause for immediate elimination. On my first round, I took several unintended practice shots, and then dropped the three scoring targets without hitting a penalty target while my opponent was busy destroying the landscape, all the penalty targets, and a passing lizard with dozens of well-placed shots and an emergency reload or ten. I was still slightly dyskinetic, so I did a little dance to honor my first round victory, bowed accidentally to the class, and sat down to wait for my next opponent. On the next round, I beat the unfortunate fool who had damaged our family honor, and avenged Ken. I bowed to him and danced a jig in celebration (dyskinesia is a little odd to watch, and it is often mistaken for really bad dancing. It comes naturally to me, because I’m a really bad dancer in the best of circumstances). For the third round, the field had narrowed considerably from the initial 43, and there was no competitor for me to shoot against. The crowd was feeling gladiatorial, though, and instead of letting me get away with a bye, forced me to shoot the course with no opponent. I dropped the scoring targets with three careful shots, amid cries of, “not that one!” and “miss, miss!” Bloodthirsty bunch. My fourth round was against a friend that Ken and I met in the class, one of a pair of brothers with a similar sense of humor. I missed my first shot, but connected with the last three, and finished ahead of our former new friend. The crowd began to turn in my direction, sensing there was an underdog event in the making, and I received an enthusiastic round of cheers. My last round was against Connor, a massive, finely-chiseled mountain of a man who was polite, professional, and had a plan to shoot every target he met. Our range master introduced us to the slavering crowd like a couple of prize fighters, and the crowd cheered and screamed for us both. I turned down the volume on my electronic ear protection and waited. We both presented and pointed in, and I established a sight picture with proper alignment, focused on the front sight, and pressed the trigger. I missed, but scared all the paint off the first scoring target. Connor connected with the penalty target, and emptied his magazine in rapid-fire frustration. I glanced to the right and saw him standing with his pistol slide-locked. The competition was mine to lose – all I had to do was to drop my targets without hitting the penalties. Three trigger presses, three pings. I won the competition. No one was more surprised than me, except for everyone else in the class and all three instructors. Ken swears he knew all along. I believe him, because he’s not only a great brother, he’s my friend. He’s had my back forever, and he is one of a small group of people I trust with my life. Amy is another; the list is not long, but it is distinguished. 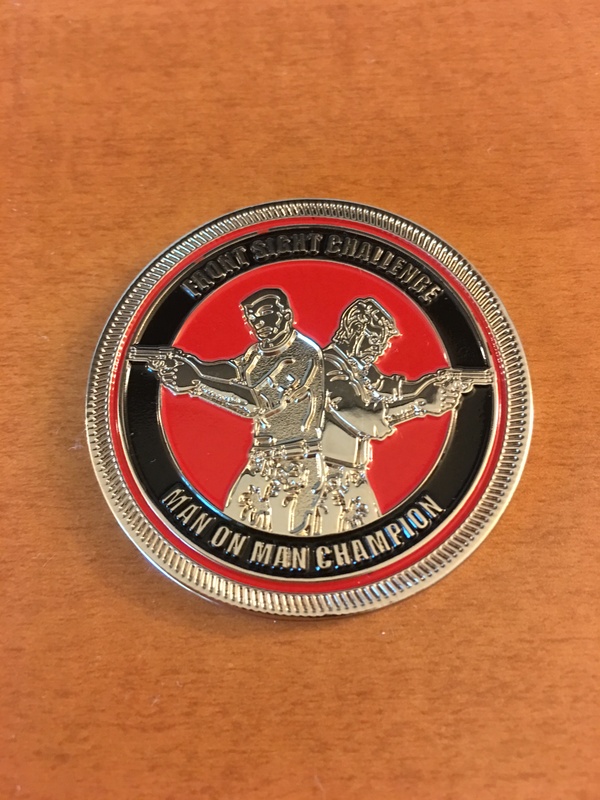 I won bragging rights and a Front Sight Challenge Coin. I won’t go down in history as anyone noteworthy, but I’m inordinately pleased with myself. And the experience reminded me of something I learned long ago, a valuable lesson for those of us with challenges and threats to face (a list that includes everyone, by the way). A little bravado can change everything. Another Spartan story underlines the lesson. Philip II of Macedon, after invading southern Greece and accepting the surrender of numerous city-states, send a message to the Spartans: “If I enter into your territories, I will destroy ye all, never to rise again.” The Spartan Council merely responded, “If.” Later, as Philip continued his campaign of conquest in Greece, he sent another communique to the Spartan Council, asking if they preferred that he enter their territory as a friend or as a foe. Their response: “Neither.” Deeply intimidated, Philip never invaded Sparta. Neither did his son, Alexander the Great. When faced with overwhelming odds, when things seem hopeless, when outnumbered, outgunned, outmatched – attitude makes a difference. Resist. Defy. Disobey. Rebel. Persevere. Good going, Corey!!! Loved your story!! Resist! Defy! Keep going!! As a person who has attended that course three times and has never done as well as you on the man-to-man challenge as you did, I am thoroughly impressed and proud of you. Yeah buddy!! Way 2 go!! Great story, fun read and educational on many levels. Glad you and Ken had such a great time and I’m sure, being older and more mature he’ll let your beating him slide. Don’t spend that coin!